October just pranced away on us! One of the reasons is that I am having trouble with uploading photos and I get so fed up that I just stomp off and go humph. Oho! I just discovered that I am too close to having used up all my allotted space on this blog- so that’s why it didn’t want to accept the photos! I went and did some ‘housecleaning’ and will delete some more stuff so that I can carry on. 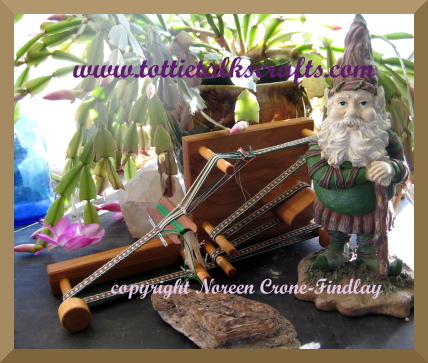 The photo that I ~finally~ figured out how to upload is of one of my new looms. It’s a lovely little loom from Goodwood Looms – one of their mini inkles. (No profit in me telling you that I love their looms, just a satisfied customer. And, I did use one of their frame looms in my book: The Woven Bag. I always feel odd saying “No affiliations”, as I do get very fond of my looms, and so I do feel ‘affiliation’ – so it’s more honest to just let you know that I don’t make profit by singing praises of the things I love). I ordered another frame loom, too, as I love the one I already have, but it appears to have gotten stuck to the desk of some bloke in Customs. Aw, c’mon! I want my loom! Puhleeeeeeeeeeeeeze release it! It’s awesome. I had done pebble weave on my Inkle loom, based on Helene Bress’s book, and it’s a very different kettle of fish than the way Ms Waddington presents it. I am soooooooooo excited by the possibilities of working with the Andean Pebble weave. As a dyed in the wool small loom aficianado, I love the potential for creating intensely complex patterning using this technique on small looms. I am so grateful to Laverne Waddington for the years of exploration and study that she has immersed herself in and for her generous sharing of her scholarship and expertise. One other thing that I just have to comment on is that she has such a lovely presence in her videos- she seems like a total sweetheart, and that comes through so beautifully in all that she does. I hope that she will be doing more books. I chose to go with the paper copy and I am glad that I did, as I like to be able to work at different places in the studio, and this way, I am not tied to the computer desk. AND… a big thank you to Syne Mitchell for all the hard work that she does in bringing such deliciousness to the weaving world! Yay! The other book that I’ve just bought is Jane Patrick’s new book: The weaver’s idea book:creative cloth on a rigid heddle loom. LINK (and I just noticed that they also have 2 of my other all time most favorite books ever at this link: Helene Bress’s Inkle Weaving and Betty Davenport’s Hands on Rigid Heddle weaving. They are MUST HAVES). The Weaver’s Idea Book is also destined to become one of my treasured books. It is stuffed full of really useful information. It’s beautifully presented, and the book itself is a sturdy piece of technology that I love: a hardcover that opens up to be coil bound inside. Again: No affiliations, just loving both books. What else have I been doing instead of blogging? Well, I’ve been busily designing crochet and knitted projects for yarn companies and magazines, so that has cut into my weaving time! And, working on new book proposals… we shall see how those go….